Convenient 2 ounce bottles, pre-filled for one application in a bicycle tyre. Easily fits in a backpack or saddle bag. A must have for the repair kit and perfect for any tubeless tyre installation. Refillable with Stan’s quart or pint. Remove valve core apply threw stem of any tubeless tyre or tubes with removable valve cores. Or dismount tubeless tyre and apply directly into tyre. Will stop slow leaks and punctures. When properly used, it will seal up to 1/4 inch punctures. The Solution can be used year round, even in sub freezing temperatures. 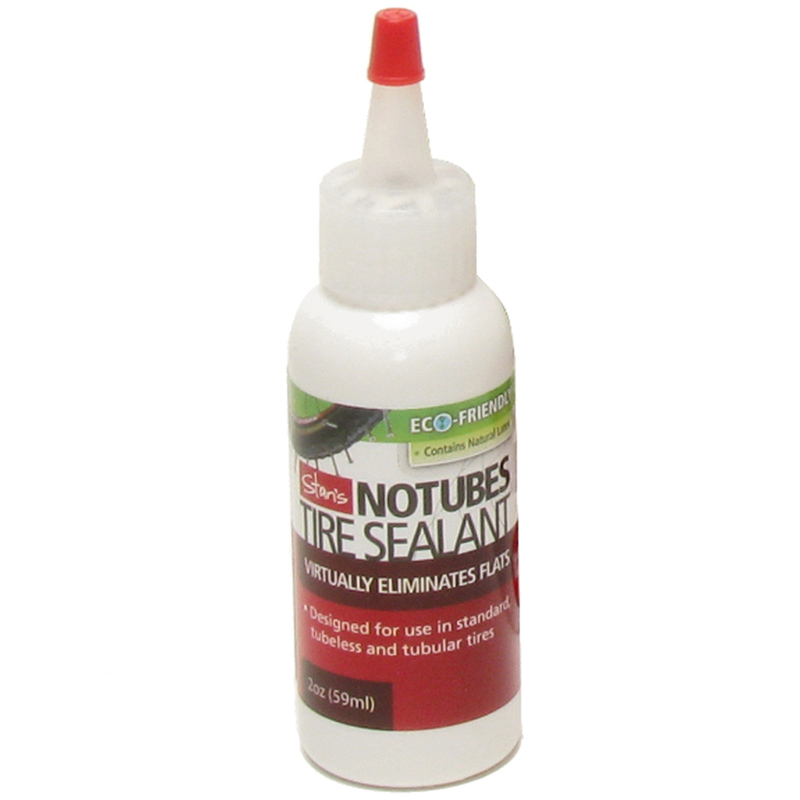 The only tyre sealant I use and trust that works well to seal up small punctures with latex inner tubes on tubular tyres. Good preventative additive for peace of mind. Does have a tendency to clog up presta valves and valve extensions if bike/tyres is stored for a long duration without use. Also slowly dries up inside the tube after 12 months of use. Excellent little container of sealant. Just the right size to take along on a ride in case you run into difficulty and need a top up. Compatible with most other sealants (eg bontrager) this stuff is good value and it works. I use these for trips away for which they've been spot on. Easy to carry around and perfect for a single use top up. Ok, so it's an expensive way to buy stans but it does ensure you get a perfect 'mix' every time and also it stays fresh as each bottle is sealed. May need 3 bottles for 2 29er tyres. Easy to fill tire with these when removing the valve core. You will need a tool for that, but if you are going tubeless, you already know that. A slightly expensive way to buy stans but a least it stays fresh as each bottle is foil sealed. After adding to my tyres, stans saved my first ride, as following some hawthorn hedge trimming, I got home to find 3 large thorns in the front tyre , pulled them out span the wheel and they sealed instantly!